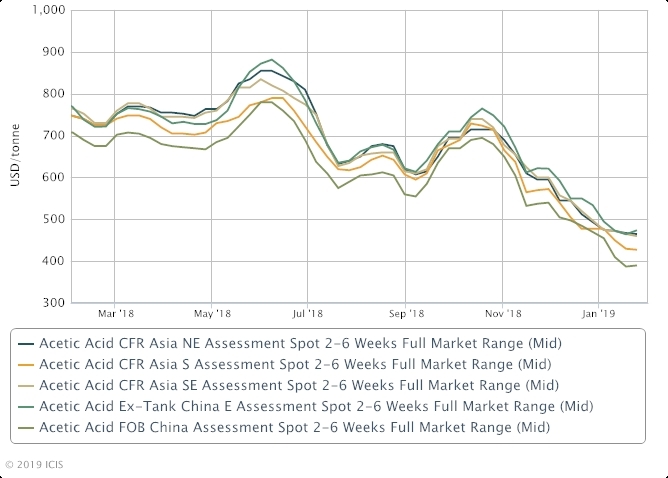 Asia’s acetic acid prices may struggle to find support amid stable-to-firm domestic prices in China on the back of restocking activities, the recent spate of plant outages which did little to tighten the market, and an anticipated demand recovery post-Lunar New Year. Market optimism as high level US and China trade talks resumed on 30 January, coupled with expectations of improved buyer confidence and pent-up demand after the Lunar New Year holidays, prompted suppliers to target higher prices. The Lunar New Year is celebrated in most parts of northeast and southeast Asia, with China to go on a full-week holiday on 4-10 February. Suppliers raised acetic acid offers for cargoes loading in end-February to early March to $425-430/tonne FOB (free on board) China. But a wide buy-sell spread with buyers in the key India market dampened discussions. China is a major exporter of acetic acid. Major producer Celanese on 1 February announced a $90/tonne hike on acetic acid in Asia outside China, effectively immediately. Prior to the price hikes, general offers for Asian-origin material varied from the low-$400/tonne levels to $460-470/tonne CFR India, up to $480/tonne CFR SE Asia, for cargoes loading in the second half of February. During the week ended 25 January, spot acetic acid prices in the key south Asia market of India were at $415-440/tonne CFR South Asia, down $5/tonne on the low end of the previous week’s price range, ICIS data showed. Several other market players were more measured in their outlook as buyers may remain saddled with recent purchases. India buyers had recently purchased substantial volumes for end-February arrival at the low-$400/tonne CFR India levels, while Chinese domestic buyers were expected to take a longer time to consume their acetic acid stocks due to the week-long Lunar New Year holidays in early February. The lack of strong demand in the broader Asian market also led suppliers to have a calmer and cautious outlook. “After the new year holidays we will need to see the inventory levels and the impact of the cost of these inventories [on buyers],” a China-based producer said. “Acetic acid producers did not cut their output substantially and they may experience a build-up of inventory during the [Lunar] New Year holidays, while downstream buyers have already stocked up and yet to consume their stocks,” a Chinese trader said. Meanwhile, downstream butyl acetate producers are in the process of raising prices amid eroded margins as affiliated feedstock normal butanol costs had also risen.